In November 2018, singer Ajibola Danladi, a.k.a. Danny Young, called out Tiwa Savage for allegedly lifting vital parts of his song 'Oju Ti Ti Won' and used it in her single; 'One' which was released towards the tail end of 2018. As it were, the case became controversial as music enthusiasts on social media dragged Danny Young for claiming that the lyrics 'Ododun la ro rorogbo, ododun la ra osa, odd dun la ro awusa' were his, when in fact the were words from a common Yoruba proverb. Few days ago, it was discovered that the song had been removed from Tiwa Savage's YouTube page. 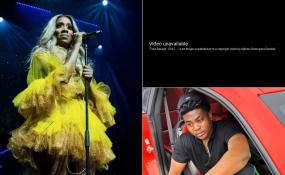 The message displayed read thus: "Tiwa Savage 'One' is no longer available due to a copyright claim by a third party", leading fans to believe Danny Young had made good his threat.